Always having both feet measured for length and width. The shoe should fit the natural shape of the foot especially around the toes. 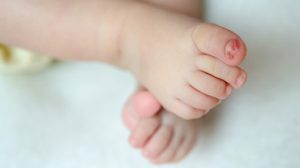 Toes should move freely and not be squashed from the top or sides, 10mm of growing room should be allowed for children, this should be measured from the end of the longest toe and the end of the shoe. Shoes should fit comfortably around the heel and not be too loose or too tight. Washing feet and keeping them dry and clean helps to avoid irritation. Wear cotton socks, change them daily and air your shoes overnight to help reduce skin problems. You notice uneven shoe wear. If you notice skin rashes, hard skin lumps or bumps on your feet. Your feet suffer in-grown toe nails, athlete’s foot or verrucas (plantar warts). You suffer recurrent pain in feet or legs. You are unexpectedly tripping or falling. If you have any concerns about your feet phone us on 6651 3824 for an appointment. We have clinics in Coffs Harbour, Macksville and Dorrigo.